Hey Coffeeholics! I apologize for my ninja stealth mode lately. I have been super busy last weekend and dead tired these past few days. Whenever I get home, I end up "lying down" for a second then completely fall into a deep sleep and wake up in the morning just in time for school. *sighs* My night time blogging session has been "fail" lately but I intend to remedy that soon. And oh boy do I have a lot of things to share! Last Saturday's activities has been so fun and quite awesome that just downloading the pics, editing it, and sharing them all is gonna take some time (ack!) which I don't have much.. huhu. I am overwhelmed by the wonderful time I had spent with fellow bloggers at the Blogapalooza event by WhenInManila.com. It was a great time for us to meet up, get to know each other, and open doors of opportunities presented by the various business partners who went there. I am excited by the possibilities and I am looking forward to interacting with them quite soon. Now just in case you missed out last Blogapalooza, don't fret! I hear that we should expect more events to come. Not only that, some of you might even get a chance to win the same loot that we got during the event! So please tune in to blogapalooza.wheninmanila.com to stay informed and updated on the upcoming events. After that, me and Jen taxied our way over to the Converse Event at Eastwood City Mall! It was the grand opening of their brand new Converse store there and we were given a chance to check out what Converse has in store for us this holiday season. I will be posting about the awesome time I had there soon! Now Coffeeholics who are still on a tight budget, never fear! I still have something for you! (haha I feel like I'm starting to sound like an infomercial! LOL) No but seriously, if you really want a pair FOR FREE, I suggest you go and click on the pic above for my giveaway. You might just win for yourself your own pair of bleach biker skinny jeans from Boutique Nayeli. 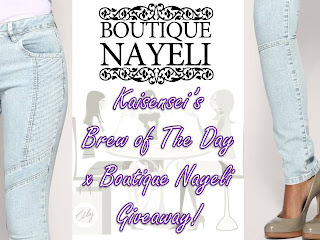 Check out my previous post about Boutique Nayeli where Shopgirl Jen poses and shows off her Nayeli Jeans. There are a lot of sizes available. So go check out boutiquenayeli.multiply.com for more info. So there you have it dears! A short summary of what's happening at Brew of The Day lately. I will be posting a whole lot more about all of these on the next posts. So do wait for that. The weekend is just around the corner.